One of the most common worries I hear from other parents considering homeschooling is “I am afraid I won’t be able to teach my child to read.” I totally get this. If your child does not learn to read well, his or her future life opportunities and daily functioning will be significantly limited. Also, your brain is not born ‘ready to read’ like it is ‘ready to learn language’. So reading must be taught and not just caught. I wrote about this in How Do Children Learn to Read? and Five Strategies to Get Your Child Ready to Read. So reading can be intimidating to teach, but, this does not mean you can’t teach your child to read. If you are feeling hesitant, then you just need to pick a good structured program. 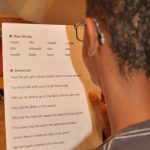 As a former speech-language therapist, I had a ton of information on how to teach children to read and may have been able to ‘just wing it.’ But, I, too, did not want to mess this part of our schooling up! And I had two very different children that I wanted to buy only one reading program for so that I could get my money’s worth out of it. My oldest, Big Fish, was a first grader at the time and he learned to read by visual memory and had somewhat weak phonics and decoding skills. In other words, you could tell him what a word said a couple times and he would memorize it, but was not great at sounding out each word. Patience level may have had something to do with that! And then I had his younger brother, Little Fish, coming up behind him who has a visual processing disorder. Little Fish is the one who I was greatly concerned about learning to read. And I mean laying awake at night worrying. I knew visual memory was NOT going to be the way he would learn to read. 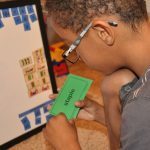 One of the big reasons we decided to homeschool was because I knew the way our schools taught reading relied heavily on learning sight words. As I talked to people and looked in online groups the All About Reading program kept popping up as a great reading curriculum. This is always a good place to start because parents know what works and does not work, but I needed to make sure it would be a good fit for us. I have learned the hard way a few times that even though a lot of people think a particular curriculum is great, it does not mean it will be a good match for my boys and/or me. Once I started researching it, I realized it was an Orton-Gillingham based curriculum. I knew Orton-Gillingham was a highly regarded method to teach children who have reading difficulties. In fact, in our area, if you would like to hire an Orton-Gillingham certified tutor, you will likely wait months on a waiting list until there is one available. I never knew that you could buy a curriculum you could use at home that would utilize their instructional approach. I was sold! So what is an Orton-Gillingham approach and why is it so highly regarded? 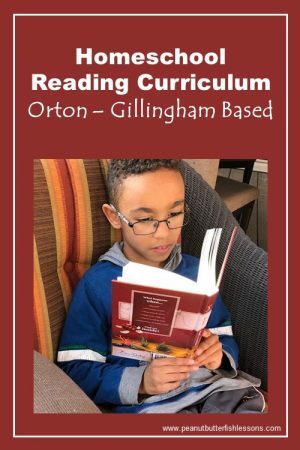 Orton-Gillingham is an instructional approach geared toward people who have difficulty with reading, spelling and writing, especially those diagnosed with dyslexia. It teaches skills directly and systematically using a multi-sensory approach. 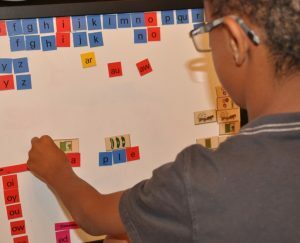 While it uses a phonics based approach, it also teaches all levels of language: word endings, grammar, meanings of words, and reading comprehension. It moves step by step from one skill to the next and works toward mastery of each skill. 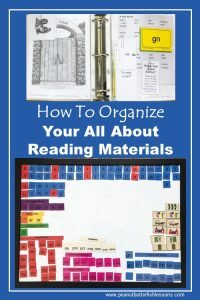 You may think after reading that description that only children with some kind of reading difficulty should use All About Reading, but I am a firm believer that all children can benefit from this instructional approach. I doubt many people are particularly strong at all the different strategies we use to read. By using a curriculum like this, you are able to strengthen all of these areas. I, personally, improved my decoding skills and now am able to sound out unknown words better in the books I read! The difference between the children with and without learning challenges is going to be how fast they move through the lessons. We are on our fourth year of using this program, and it has worked well for both my advanced reader and my struggling reader. The difference has been how fast they move through each step. Big Fish did 4-8 lessons a week when working through it. In the beginning, Little Fish took at least a week to complete each lesson. Now he is completing about 2-3 lessons each week. The first thing I liked right away when I started the program is that it is completely scripted so I can just pull out the teacher’s manual and the materials each day and teach the lesson without much extra thought. We also like that there are different activities within each lesson, yet a similar routine to the lessons. And it leads children through the process our brains use to learn new words that I discussed in How Do Children Learn to Read? Many lessons start with my teaching a concept using the magnet tiles on the white board. The concept may be a new vowel team (e.g., ‘ea’ or ‘ou’) or it may be consonant suffixes. This teaches the child the letter-sound associations. Then we practice this concept through a fun activity or two so we are improving our decoding of words with this new concept. Next, we review target words through flashcards and then through the fluency practice pages so that we can start to move from decoding the words to learning them by sight. Typically the next lesson uses these newly acquired words t to read a story. These are my son’s favorite lessons! For the story lessons, there is a warm-up page to introduce children to the new words they will encounter in the story. There is often a fun activity before or after the story to aid comprehension of the story and there are scripted questions to lead discussion of the story. We like that the entire curriculum is based on structured rules. I am able to reference these rules when the boys encounter a new word outside of our reading lessons to help them read the word. For example, when Little Fish encountered “creek” in a book yesterday and struggled, I could remind him to think about what the vowel team “ee” says. 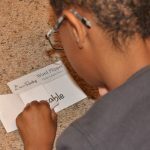 When he has trouble sounding out a multi-syllabic word, I can remind him of the rules for dividing syllables and label the type of syllable for him to remind him if the vowel will be long or short. For example, if he struggled with “idea”, we could divide it into syllables and I could remind him each syllable is an open syllable and he would remember that meant they would have long vowel sounds. Finally, the activities are mostly fun, except it took Little Fish awhile before he was comfortable reading the fluency practice sheets at the ends of the lessons. And we like that they are multi-sensory and he gets to use his preferred tactile/kinesthetic learning style to interact with the lessons. Big Fish on the other hand, as an auditory learner, liked how the information was organized into rules and categories. Next ›How Do Children Learn to Read?